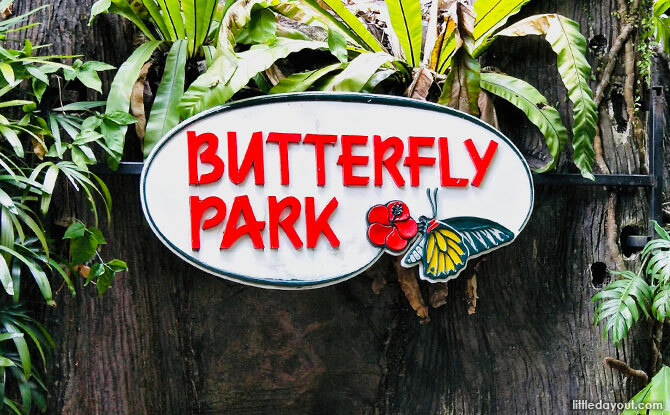 Surrounded by lush tropical greenery, Butterfly Park & Insect Kingdom on Sentosa showcases a great variety of fluttering butterflies, exotic insects, and birds. 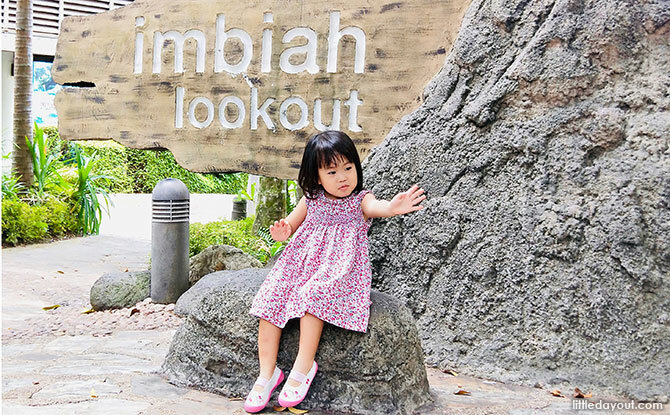 Located at Imbiah Lookout on Sentosa, Butterfly Park & Insect Kingdom is an outdoor experience for children, tourists, and nature lovers alike. 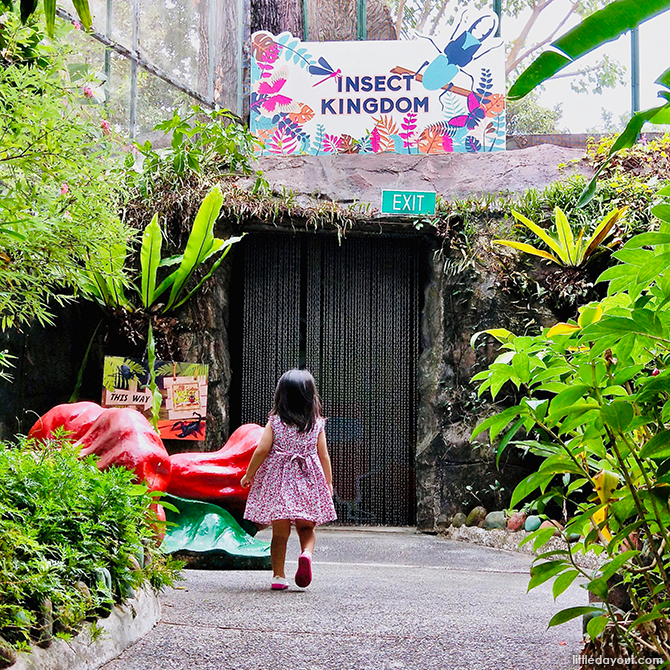 Filled with the smells, sights, and sounds of an authentic tropical rainforest, Butterfly Park & Insect Kingdom is a multi-sensory and interactive experience. 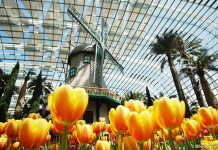 A conservatory and museum, Butterfly Park & Insect Kingdom is home live butterflies and insects, including rare and exotic varieties. 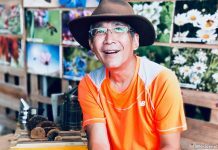 I’d braced myself to be greeted by hundreds of butterflies fluttering all around me – much like when I visited Entopia by Penang Butterfly Farm. It was surprisingly calm, which I suppose is to be expected given that the size of the Butterfly Aviary is only a fraction of the entire park. My daughter is always looking out for butterflies when we’re at the playground, so it really thrilled her to see a few more butterflies than usual fluttering close by when we stepped into the Butterfly Aviary. In this respect, I’m glad she wasn’t overwhelmed by the butterflies. 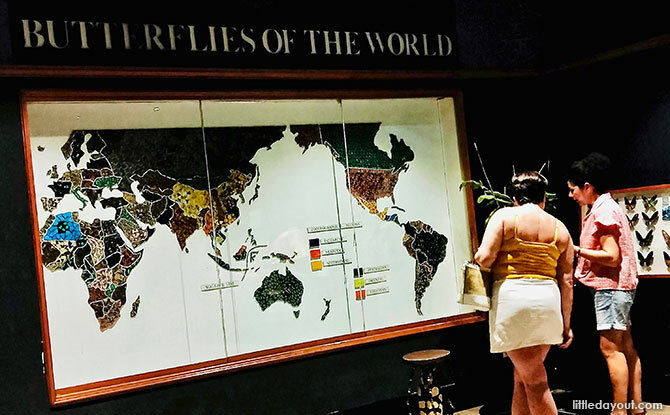 In reality, a large portion of the butterflies and insects housed within the Butterfly Park And Insect Kingdom are actually mounted on boards and display cases in the Insect Kingdom Museum. The Butterfly Aviary leads to Animals Encounters – an Iguana and Bird Aviary – which is more generous in size, and resembles a tropical rainforest with lots of tall trees, ferns, and a little stream that runs through. 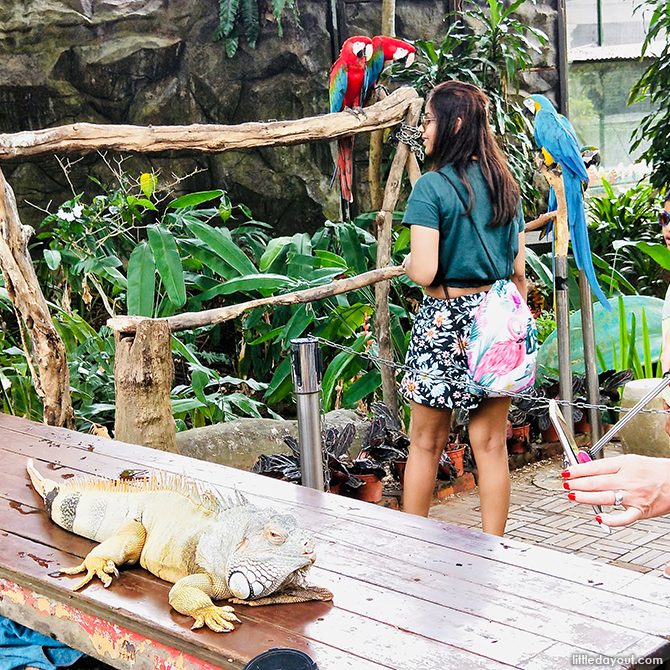 Visitors who go through the Iguana and Bird Aviary can expect to take photos with – and of – parrots, toucans, and a particularly tame old iguana. Personally, I was quite amused to see parrots in what is supposed to be a butterfly park, but I guess they’re in some way connected to the rainforest eco-system? 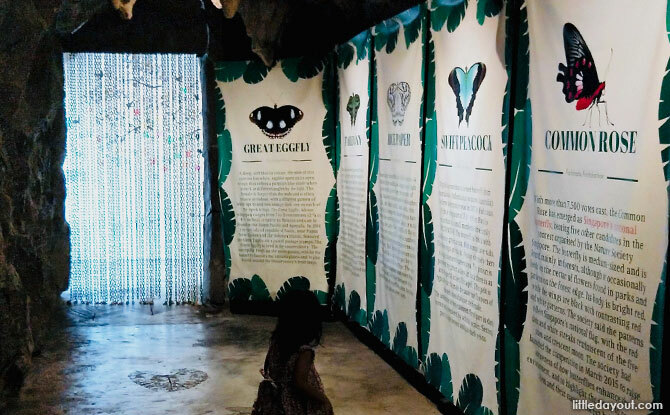 Once you’re done with Animals Encounters, a little footpath leads into The Insect Kingdom Museum. 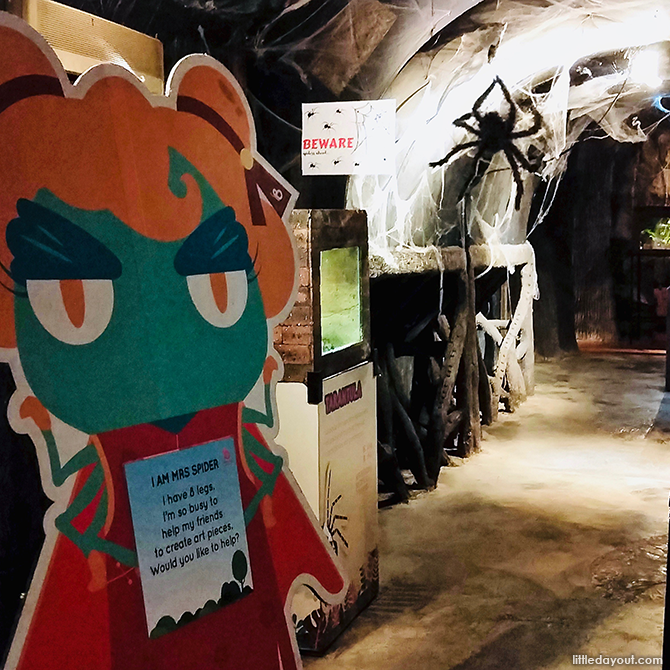 Designed to look like an underground cave, The Insect Kingdom Museum is where visitors will find a mix of board-mounted displays, and glass display cases of beetles, scorpions, tarantulas, and of course, butterflies. 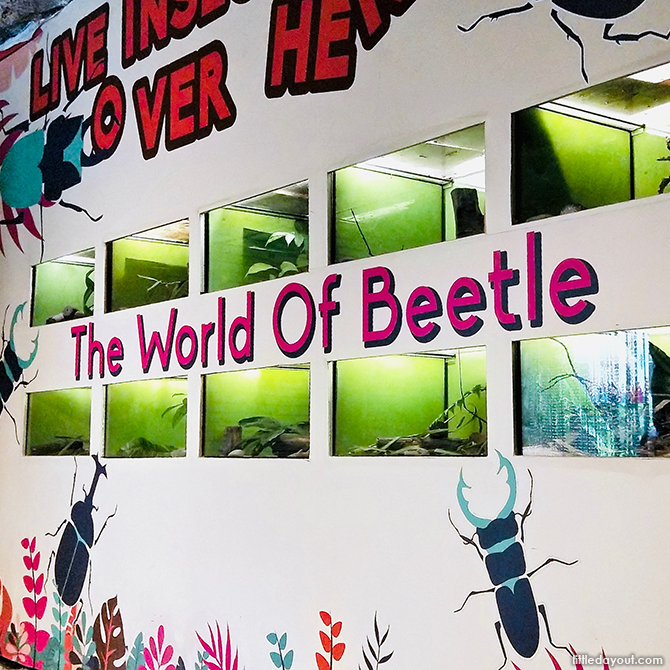 As you step in, The World of Beetle – a wall of live specimens of numerous species of beetles – welcomes you. 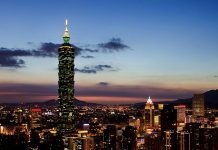 Continue on through this man-made cave of insects, and you’ll find yourself in the air-conditioned Museum displaying the likes of beetle and butterfly fossils, and world maps. 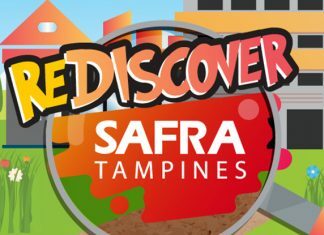 A ticket to Butterfly Park & Insect Kingdom will set you back S$16 if you’re a Singapore Citizen, or S$18 for tourists. 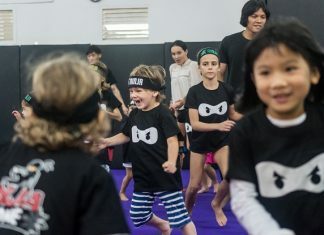 If you don’t have a specific interest in butterflies, insects or nature, Butterfly Park & Insect Kingdom may not be top on your list of to-dos, but it’s a little something different to expose the little ones too, plus the under-3 set enter for free. Never hurts to let them see and do more right? 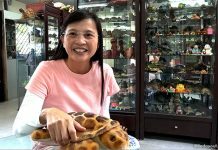 Butterfly Park & Insect Kingdom is located at 51 Imbiah Rd, Singapore 099702 and opens daily from 9.30 am to 7 pm (last entry at 6.30 pm).